The three-disc Buster Keaton - The Short Films Collection collects an extraordinary run of 19 comedy films made between 1920 and 1923. Up until this point, the comedian had been largely playing second fiddle to Fatty Arbuckle, and these brilliant short films, ranging in length from 17 minutes to 24 minutes, provided both a showcase for his onscreen talent and a proving ground for his off-camera abilities. The films were all directed by Keaton, mostly alongside Eddie Kline. From the first made (though not first released) two-reeler The "High Sign" in 1920 up to 1923's The Love Nest, Keaton would experiment, refine gags, and prepare for his first major longform feature, Three Ages. Keaton's persona was already firmly in place by the time he undertook this venture. His nickname of "The Great Stone Face" was well earned, as the performing Buster was almost eerily unflappable. The world would conspire against him and descend into chaos, and he would react with the same unmoving expression. Even as his body moved at full speed, his eyes never panicked. This made the physical gags all the funnier. The first handful of films on disc 1 shows Keaton stumbling into mistaken identity plots and playing around on rickety sets. The hilarious One Week, for instance, features Keaton building a pre-fab home for his new bride (Sybil Seely, who co-stars in several of these first efforts) and suffering mishaps on the job. He falls off ledges, tumbles through holes, and even has a wall fall on him, narrowly missing being crushed by standing in the right spot to have an open window cover him instead of the wall. In Neighbors, he builds a wicked device in a gateway that spanks his opponents going one way, smacks them on the head going the other. The physical daring is regularly astounding. Many of the stunts will, in addition to making you laugh, compel you to exclaim, "How did he do that?" There appears to be little cushioning or trickery to protect this very committed actor. Perhaps most impressive at this stage, though, is the sequence in 1920's The Scarecrow involving Arbuckle's dog. The pooch chases Buster at full speed, jumping over obstacles and through windows. They circle the ledge of a hollowed-out shack, leaping over gaps, the dog never missing its mark. 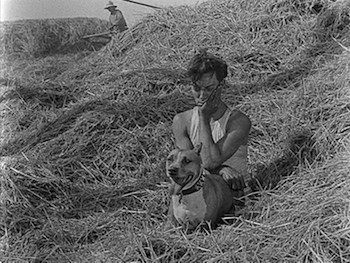 They say never work with children or animals but Chaplin had the Kid, and Keaton had this dog. Keaton hard really only been directing full time for a year when he made The Play House, which for me shows a significant leap in terms of quality and inventiveness. The memorable opening sequence begins with him imagining himself as every member of a performance at the theater where he works--but not just on stage, every member of the audience, as well. He is every man in the orchestra, playing all the instruments, and he is every attendee listening, young and old, man and woman. The effects are seamless and the characters amusingly distinctive. While we now can see how he never crosses the lines between the multiple Keatons in frame, the lines aren't actually visible. 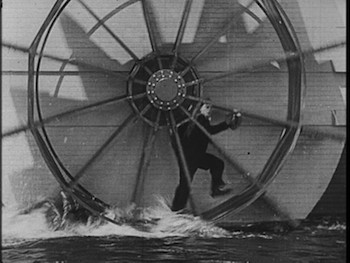 Forget the silent era, this would be impressive now. Hell, insursance companies wouldn't even let most of these films get made now, not with the actual comedians doing the real stunts. Jim Carrey? No way. The rest of The Play House doesn't conform to the mistaken identity plotting, even if Buster does take on different personas. His impression of a monkey, complete with suit and make-up, is priceless. By letting him also be himself rather than trying to convince his antagonists that he's not someone else, this particular film also shines a light on what is so appealing about the Keaton persona: he is a genuinely likable guy who is always beset by bullies, and he quietly fights back, flummoxing their plans, and sneaking out of their would-be tyranny. He is a quintessential comedy "type," the prankster who can't be beaten, but lacking the mean spiritedness and sarcasm of similar types. Consider him more of a Mickey Mouse than a Bugs Bunny (though, it's the animation studios that borrowed from Buster, not the other way around). Maybe it's why some of the darker gags in The Frozen North seem so weird, even as they make us laugh. He's not supposed to be the bad guy (and, of course, the punchline is that he isn't). 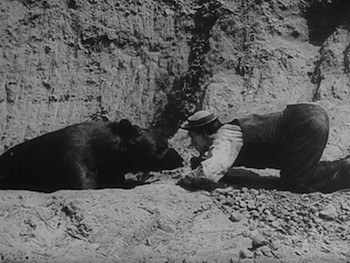 The Paleface, his first film of 1922, sees him on the side of the ultimate underdog, helping a Native American tribe get back the land some white developers swindled them for. He also takes on larger groups, such as the family of Polish immigrants he accidentally marries into in My Wife's Relations or even the whole police force in Cops. In others, like The Blacksmith, he tries to do a regular job with predictable results; Day Dreams is all about how he's not suited for any occupation. The Frozen North shows us the comedian's penchant for grand vistas and wilderness locales. The Electric House lampoons early techno culture and uses ingenious home devices as comedic props (and surely influenced Jacques Tati). 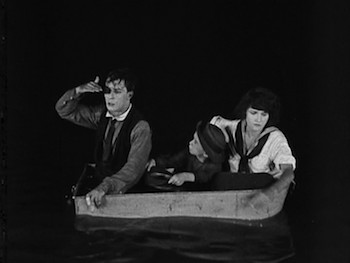 In other words, the films run the whole gamut of comedic possibilities, and it's no surprise that by the last entry, 1923's maritime adventure The Love Nest, Keaton was writing and directing all on his own. 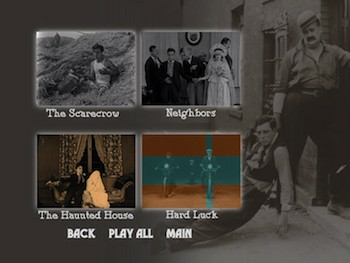 Buster Keaton - The Short Films Collection: 1920-1923 is the chronicle of an artist coming into his talent. Over the nineteen films, Keaton hones his craft while delivering consistent laughs, creating an enduring legacy that, at this point, was only just getting started. Given the age of these films, quality naturally varies based on how well preserved the available source material was. Most all of the full-frame features look pretty good considering. Yes, there are scratches and marks on the prints for a lot of them--My Wife's Relations has a noticeably fuzzy couple of shots, The Blacksmith has some burned out images--but never so much as to obscure the images and most of the shorts are complete without any jumpy edits or gaps. 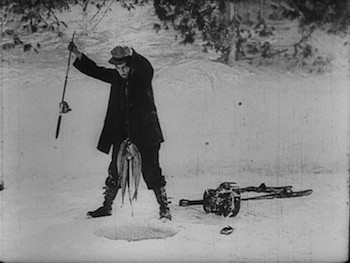 One notable exception is the 1921 film Hard Luck, which has about three minutes missing, ranging from small gaps in the early reel to the entire finale being absent. In this case, explanatory cards have been added to let modern viewers know what they are missing. Day Dreams and The Electric House have missing scenes, as well. Four of the films--The "High Sign," The Boat, Cops, and The Balloonatic--all also have alternate versions where digital techs have gone in and used digital noise reduction to clean up some of the surface damage. While this does make for a clearer picture, as with modern releases, the DNR can tend to flatten out the image and take away some of its cinematic qualities. It's kind of like looking at an airbrushed photograph rather than seeing what the picture's subject really looks like. 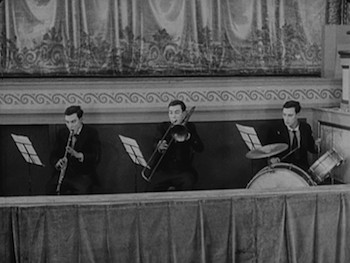 The films all have musical accompaniment, with different composers and musicians--though Ben Model and Robert Israel are the names that kept popping up most often. The music is fairly good, most of it works in tandem with the visuals without overdoing it. Convict 13 and My Wife's Relations spring to mind as being a bit too "zany," with slide whistles and other poorly timed effects. The Paleface also had some so-so sound effects. I prefer the ones that keep it simpler, with piano and violin like The Haunted House or a plain organ accompaniment for The Boat. Kino has put all three discs into a multi-tray plastic case. A small interior booklet with info on Keaton and on the films is included, as is a flier for the International Buster Keaton Society. Fourteen of the movies (not fifteen, as listed on the package) have accompanying on-disc visual essays put together by a selection of critics. These short featurettes examine each movie, looking at various elements of what makes them work. I have added a * to the list above to indicate which of the shorts get this treatment. In addition to these, there are a four similar pieces looking at locations used in the films. * rare alternate material from The Goat, The Blacksmith, and The Balloonatic. * "The Men Who Would Be Buster": three excerpts from other films and one complete slapstick short that show other comedians who were following in Keaton's footsteps. 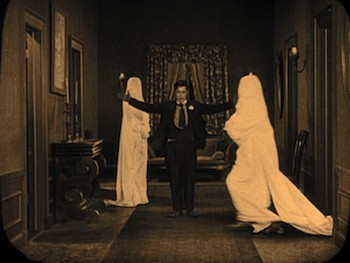 * "Character Studies": A 1922 "gag film" with guest cameos by Keaton, Arbuckle, and others. * "Seeing Stars": Also 1922. 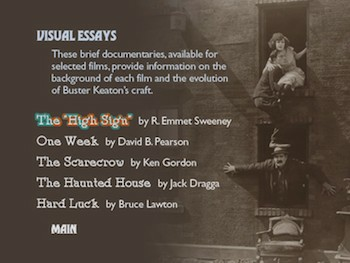 Excerpts from a promo reel, including footage of Keaton. Highly Recommended. 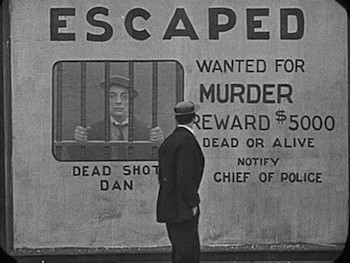 Buster Keaton - The Short Films Collection: 1920-1923 is an unprecedented, unparalleled run of fantastic comedy from the silent era. Nineteen films, four years, not a stinker in the pile. Buster Keaton came into his own over these, setting the stage for the longform work to come. This is slapstick at its finest. Inventive, clever, often sweet, always hilarious.